I know I should be eating more fresh fruit, but I have type 2 diabetes. Last weekend I enjoyed a few slices of watermelon, and I was surprised when I tested my blood sugar and saw that it spiked over 200. Should I forget about eating more fresh fruit? No! 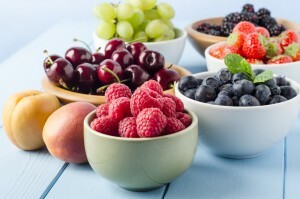 Fresh fruit should be included in every diet, even if you have diabetes. Aim for 1.5-2 cups a day. Fresh fruit contains all sorts of nutrients, including vitamins, minerals, phytochemicals and fiber. As you probably experienced with the watermelon, fruit can also satisfy your sweet tooth while providing huge nutritional benefits that cake and candy simply don’t offer. But you should be aware that, as with any carbohydrate-containing foods, portion size matters to your blood sugar. And, different fruits have different levels of carbohydrates and fiber, both of which affect your blood sugar, or blood glucose. You likely already know that unmanaged high blood glucose can cause serious, even life-threatening consequences, including blindness, kidney disease, heart and vascular disease, and neuropathy (a disease of the nervous system). The American Diabetes Association recommends that people with diabetes keep their blood glucose level to less than 180 milligrams per deciliter of blood two hours after eating. For people without diabetes, the normal level is less than 140 mg/dl. You and your doctor may have set your after-meals target lower, but whatever the case, it’s good to recognize what might spike your blood sugar so you can take steps to reduce your risk. Fruits lower in carbohydrate and higher in fiber will likely have less of an effect on your blood sugar. Below is the calorie, carbohydrate and fiber content for specific portion sizes of some common fruits. Find information about other fruits in the National Nutrition Database, available under “What’s In Food” atnutrition.gov. Raspberries, 1 cup (4.3 ounces): 65 calories, 15 grams carbohydrate, 8 grams fiber. Peach, medium (5.3 ounces, about 1 cup sliced): 60 calories, 14 grams carbohydrate, 2 grams fiber. Strawberries, 1 cup halves (5.4 ounces): 50 calories, 12 grams carbohydrate, 3 grams fiber. Orange, 1 cup sections (6.5 ounces): 85 calories, 21 grams carbohydrate, 4.5 grams fiber. Blueberries, 1 cup (5.2 ounces): 85 calories, 21 grams carbohydrate, 3.5 grams fiber. Apple, extra small (3.5 ounces, about 1 cup sliced): 55 calories, 21 grams carbohydrate, 3.5 grams fiber. Cantaloupe, 1 cup diced (5.5 ounces): 55 calories, 13 grams carbohydrate, 1.5 grams fiber. Banana, extra large (5.4 ounces, about 1 cup sliced): 135 calories, 35 grams carbohydrate, 4 grams fiber. Honeydew, 1 cup diced (6 ounces): 60 calories, 15 grams carbohydrate, 1.5 grams fiber. Grapes, 1 cup (5.3 ounces): 105 calories, 27 grams carbohydrate, 1.5 grams fiber. Watermelon, 1 cup diced (5.4 ounces): 45 calories, 11.5 grams carbohydrate, 0.5 grams fiber. Chow Line is a service of the College of Food, Agricultural, and Environmental Sciences and its outreach and research arms, Ohio State University Extension and the Ohio Agricultural Research and Development Center. Send questions to Chow Line, c/o Martha Filipic, 2021 Coffey Road, Columbus, OH 43210-1043, orfilipic.3@osu.edu. Editor: This column was reviewed by Dan Remley, specialist in Food, Nutrition and Wellness with Ohio State University Extension. OSU Extension is the outreach arm of the College of Food, Agricultural, and Environmental Sciences at The Ohio State University. We’re thinking of incorporating more beans in our meals, primarily to reduce the amount of meat we’re eating (and buying), but also because they’re supposed to be very good for you. But my husband, who has type 2 diabetes, is worried about adding more carbohydrates. Is this a bad idea? Actually, beans are a great option for everyone, perhaps especially for people with diabetes. A 2012 study in Nutrition Journal tested the effect that pinto beans, black beans and dark red kidney beans have on blood sugar in people with type 2 diabetes when eaten with white rice, which is known to cause blood sugar spikes. The researchers tested participants’ blood sugar every 30 minutes for three hours after the participants ate either white rice alone or rice with one type of the beans. Even though the meals with beans contained more total carbohydrates, the participants’ blood sugar was highest at each interval after they ate the rice alone than when the rice was paired with beans. If your husband is concerned, though, encourage him to keep a close eye on his blood sugar levels after eating a bean-based meal. If he notices significant differences and is on insulin, he should discuss any changes in dosage with a health professional. That said, beans are a healthful option that deserve a place at the table for just about everyone. 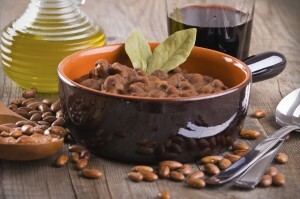 In the Dietary Guidelines for Americans, beans are considered a unique food: They can be considered as either a meat substitute or a vegetable. They are high in both plant protein and fiber, as well as B vitamins, iron, folate, calcium, potassium, phosphorus and zinc. The fiber in beans can be significant. Adults should eat anywhere between 22 grams to 34 grams of fiber a day, depending on their caloric intake — most Americans don’t get nearly that amount. Neither do Americans consume enough beans and other legumes, eating only about half the recommended amounts of 1.5-3 cups a week for men and 1-2 cups for women. Adding a bean-based meal or two to your weekly menu could go a long way to helping you meet those recommendations. If you use canned beans, consider buying those that are lower in sodium. Or, rinse the beans before using them — that alone will reduce the sodium quite a bit. If you start with dry beans — an economical option — first rinse them in cold water, picking out any pebbles or stems. Cover the beans with three times their amount of water and either soak for six hours, or bring to a boil and soak for at least two hours. Soaking overnight or after boiling makes them less likely to give you gas. Then, drain the beans and cook them in fresh water according to package directions. If you currently don’t eat a lot of beans, you may want to add them gradually to your diet. This will allow your body to get used to them and reduce the chance of gas and other gastrointestinal distress. Editor: This column was reviewed by Carolyn Gunther, Ohio State University Extension specialist in Community Nutrition Education. No one in my family has ever had diabetes. Does that mean I’m not at risk for developing it? Although there is a genetic component to diabetes, it’s not 100 percent: Many people develop type 2 diabetes without having a family history of the disease. Conversely, it’s not guaranteed that you’ll develop the disease even if you have close family members who have it, though your risk is higher. A warning: You may think no one in your family has ever had diabetes, but many cases go undiagnosed. So you may be operating under a false sense of security. Type 2 diabetes accounts for about 95 percent of all diabetes cases. It’s marked by high blood glucose levels primarily caused by the body’s inability to use its insulin efficiently. In contrast, type 1 diabetes is caused by the inability of the pancreas to produce insulin. Insulin is what gets glucose out of the bloodstream and into cells where it can do its work. According to the American Diabetes Association (ADA), if one of your parents has type 2 diabetes, your risk of getting diabetes is 1 in 7 if your parent was diagnosed before age 50, and 1 in 13 if your parent was diagnosed after age 50. If both parents have type 2 diabetes, your risk is about 1 in 2. Overall, it’s estimated that diabetes (both types) affects 1 in 12 Americans, though only about 1 in 17 Americans have been diagnosed. A better way to estimate your chance of developing type 2 diabetes is to take a close look at your risk factors. The ADA offers an online tool to evaluate your risk — just go to http://www.diabetes.org and search for “risk test.” Risk factors include age, being overweight or obese, not exercising regularly, and having high blood pressure. Studies also show that people with untreated sleep-related problems, such as sleep apnea, also have a greater risk of developing the disease. Even small changes can lower your risk. Losing just 10 to 15 pounds and starting an exercise program of 30 minutes a day, five days a week, can greatly reduce the chance of developing diabetes. Cuts or bruises that heal slowly. Recurring skin, gum or bladder infections.